Civic Voice’s Annual Convention Birmingham 19-20 October 2018: Booking now for ‘Development in a conservation area’! Bookings are now open for the annual gathering of the civic movement which will be in Birmingham on 19 – 20 October 2018, with the theme ‘Development in a conservation area’. We will be hosted by Birmingham Civic Society and the theme in 2018 will be ‘Development in a conservation area’. We will be learning the lessons from the Civic Voice Design Awards and showing how communities are championing well-designed new build, heritage and public realm projects across England. The key theme running through the convention will be communities celebrating high quality development in a conservation. Find out about last year’s Civic Voice Design Awards award winners here. The dates are 19/20 October. Booking opens in February 2018. The Civic Voice Annual Convention is a fantastic celebration. We talk about the annual convention a lot to members and this year’s event is going to be the biggest and best yet. We are passionate about the annual gathering as we know the success it brings to groups in being re energised. You meet likeminded people. It takes your learning and understanding to another level because you get to experience the vibrancy of the civic movement coming together. Reading, listening and participating are all great things to do, but by coming to Birmingham, you will experience ‘Civic Voice’. It is a different level of engagement. The Civic Voice Annual Convention is the best Civic Voice event of the year and we know it will help you and your civic society yield extraordinary results. We think it is an event that every committee member for a community group across England should consider. The purpose of the Civic Voice Annual Convention is to connect the civic movement together and to help groups influence the national picture. Both were aims civic societies said they wanted from Civic Voice when we set up and the annual convention will be a key part of the Birmingham Civic Society Centenary celebrations. You can find out more about Birmingham’s celebrations on their website here. 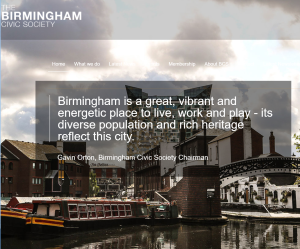 The Civic Voice Annual Convention will be led by Gavin Orton, Civic Voice Trustee and Chair, Birmingham Civic Society.